Besides all the obvious challenges of making a haggis (not least obtaining all the ingredients) it is surprisingly difficult to settle on a recipe. 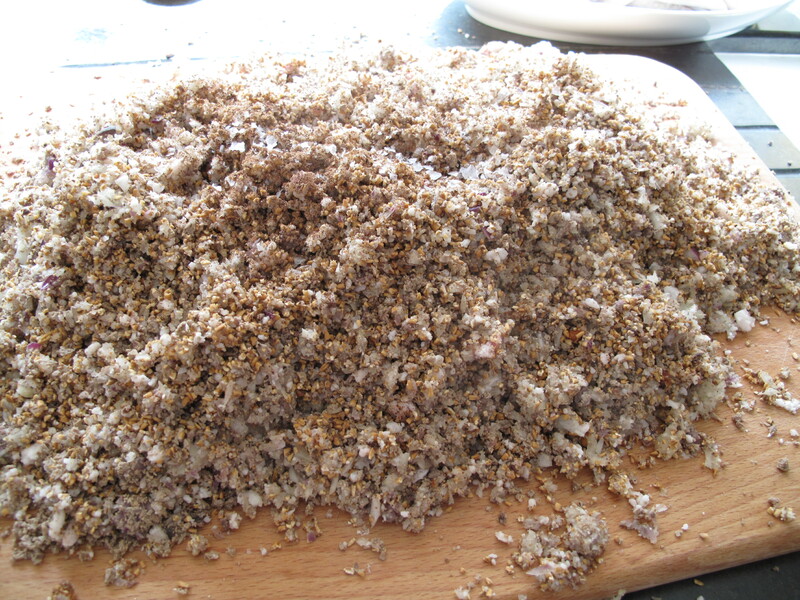 Although the basics are so well known as to seem unchangeable – oatmeal, sheep offal, pepper-based spicing – the briefest look at historical sources reveals subtle and not-so subtle variations in the basic meats and the relative quantities of everything, which make a huge difference to the end result. In The Taste of Scotland (1970) Theodora Fitzgibbon suggests using Lady Logan’s receipt of 1856. Despite the author being a “Lady”, several of the details point to this being a basic, economical, peasant-level haggis. For one thing, Lady Logan proposes using an equal quantity of toasted oatmeal to sheep parts – 2lb oatmeal, 1lb mutton suet and 1lb assorted offal – and a lone onion. Secondly, although she suggests venison liver as a possible refinement, she sticks with the use of the sheep’s suet and lights, including the strong-flavoured lung, and the stock derived from its cooking. Finally, her casing is a sheep or lamb’s stomach, which of course gives a very strong tripe element both to the smell of the cooking and the taste of the final dish. Her instructions are simple and to the point: chop and mix the whole lot up (presumably in a bowl), season with pepper, cayenne and allspice, stuff the stomach, sew it up, prick it, and boil it. Margaret (Meg) Dods, on the other hand, in the 5th edition of her Cook and Housewife’s Manual (1833), suggests a somewhat more refined and extravagant dish. For one thing, she specifies beef suet and beef stock, which would diminish the strong lamb flavour. For the same quantity of meat as Lady Logan, she also suggests adding at least 4 whole onions (raw) plus a dozen small ones (scalded), and only a couple of cups of toasted oatmeal. For further refinement (and, we can read between the lines, less strong sheepiness in both taste and smell) she proposes substituting the lights with kidney and tongue. In addition to the pepper, cayenne and allspice seasonings, she adds the acidity of lemon juice or vinegar. By specifically instructing us to mix it on a board, and to add the liquids only once the stomach is stuffed, she ensures a much lighter texture. Taking refinement even further, her Royal Haggis is cooked in a veal caul, again far less pungent than the sheep’s stomach, and has anchovies, parsley, mushrooms and Madeira as additional flavourings. Although haggis is thought of as a quintessentially Scottish dish, it was well known in England until well into the nineteenth century not only in its “Scottish” form but in regional variations. Although English recipes include all sorts of ingredients found in other members of the pudding and sausage family that haggis belongs to – eggs, sweeter spices like nutmeg, or even sugar in Northern England – sheep offal and fat, chopped small, and stuffed in a bag have been its common features for more than 500 years. In his English Huswife (1660) Gervase Markham describes a “Haggas or Haggus” whose ingredients (oatmeal, blood, and liver from a sheep, calf or pig) make it sound much more like that other Scottish (and British regional) classic: black pudding. Hannah Glasse’s 1767 treatment in the Art of Cookery may reflect English country practices in Shropshire and Gloucestershire, but at the same time brings us closer to Meg Dods: Glasse’s “Scotch Haggass” is made of the lights, heart and chitterlings – of a calf. Haggis turns out to be a wonderful illustration of what happens when any dish is adopted as a national classic, as it is in Scotland. 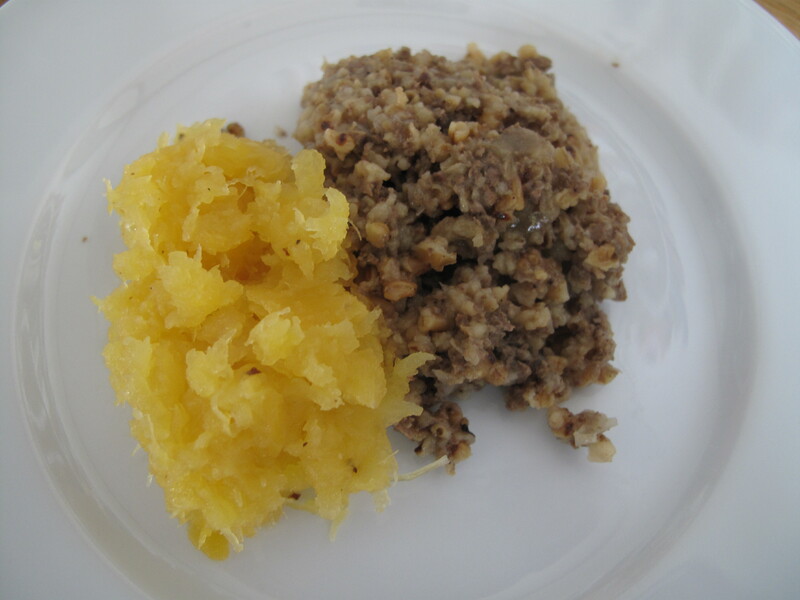 Meg Dods opens her recipe for “our good love, the Scotch haggis” by likening its spirit to that of other national dishes – the French ragout and the Turkish pilau among them. It has obviously long had a strong association with Scotland, the land of sheep and oatmeal, but it has equally been part of the English identity, and this seems long forgotten – even sacrilegious to suggest. English haggis? Impossible! I grew up in Scotland, with black pudding for lunch in my Falkirk primary school, and the smell of haggis regularly wafting down the stairs from the dining room of my Edinburgh secondary school, and whether we liked it or not we all knew this was special, Scottish food. The less other people liked it, the more proud of it we could be. Later when I moved to London it became clear to me that most people I met had never tasted – and were disgusted by the very idea of – a haggis. But it turns out that here in the UK we actually all share the culinary heritage of haggis. Maybe you just need to catch the reek of it at an early enough age to be able to find it delicious. I mentioned at the beginning that making a haggis is challenging, not least because it is difficult to obtain the basic ingredients. You may have a butcher able and willing to find them for you. Ask him. You may find, as we did, that he will direct you to your local wholesale market, in my case, Smithfield. Based in central London, and open to the public on every weekday between 05.00 and 07.00, most suppliers do not have the whole animal. Don’t be put off by the ones that tell you it’s impossible to buy what you need. Look up at the signs over the heads of the vendors in the Central Market and notice Channel Meats, offal specialists: they will sort out your lights and stomachs; then pop over the way for sheep suet from Market Provisions. The second challenge is actually doing it. 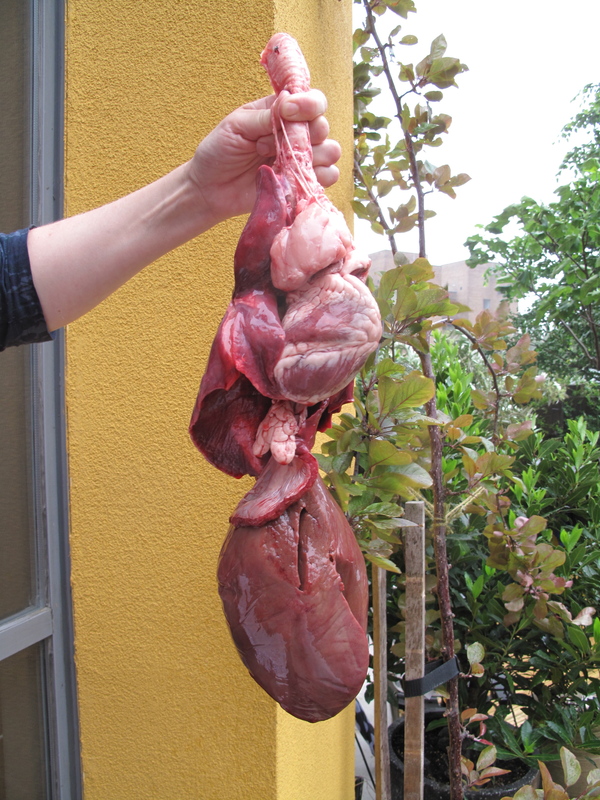 The sight of the pluck of a sheep – its lungs, heart, spleen and liver all still attached with the windpipe at the top is not for the faint-hearted. And it’s heavy. 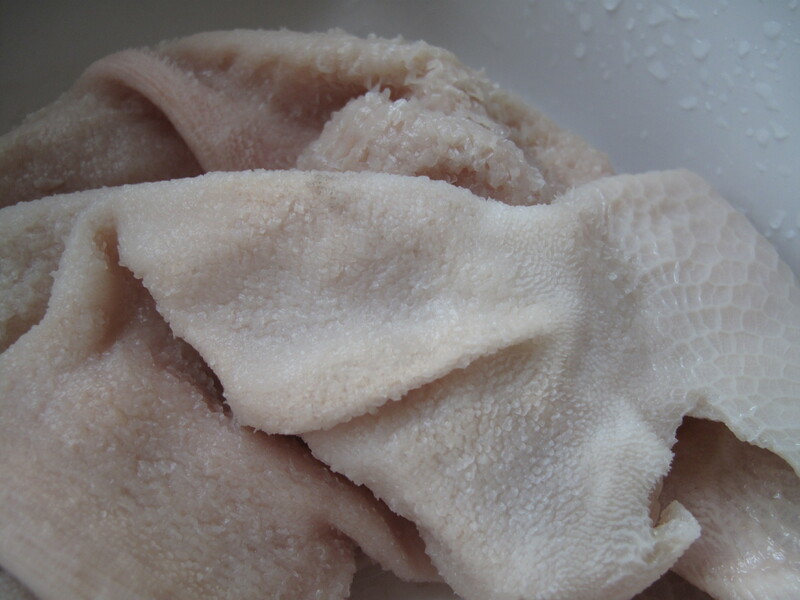 Raw, its odour might be difficult to stomach; while cooking, it’s also a strong smell, though nothing like as pungent as the stomach casing, which is pure tripe, equally powerful raw, cooking or cooked. You really need to have good ventilation, and preferably (unlike me) have a kitchen that is actually a room, not an open-plan part of your entire living space. 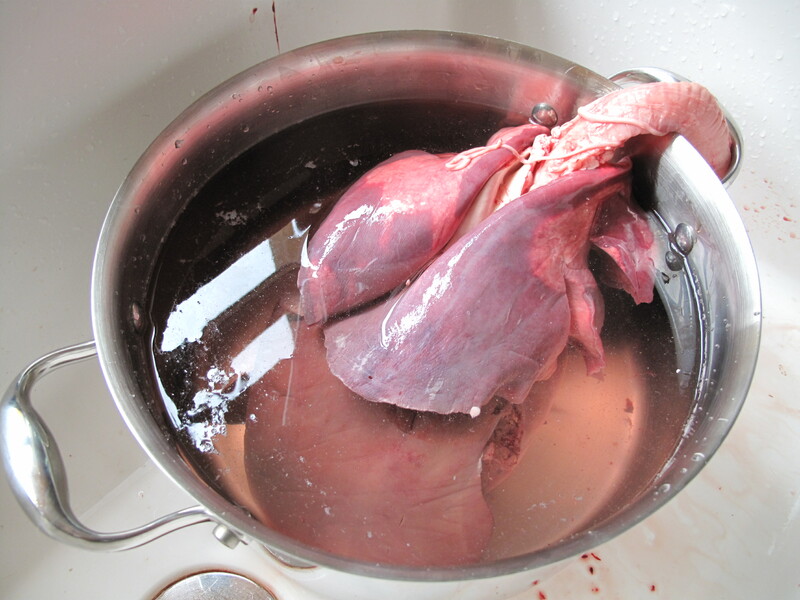 Even if you like haggis, you may not want to live with the smell of it for the 4-5 hours of cooking and beyond. I made the recipe using all sheep ingredients; it was strong and pungent, which I liked, but which was too much for some of my audience. 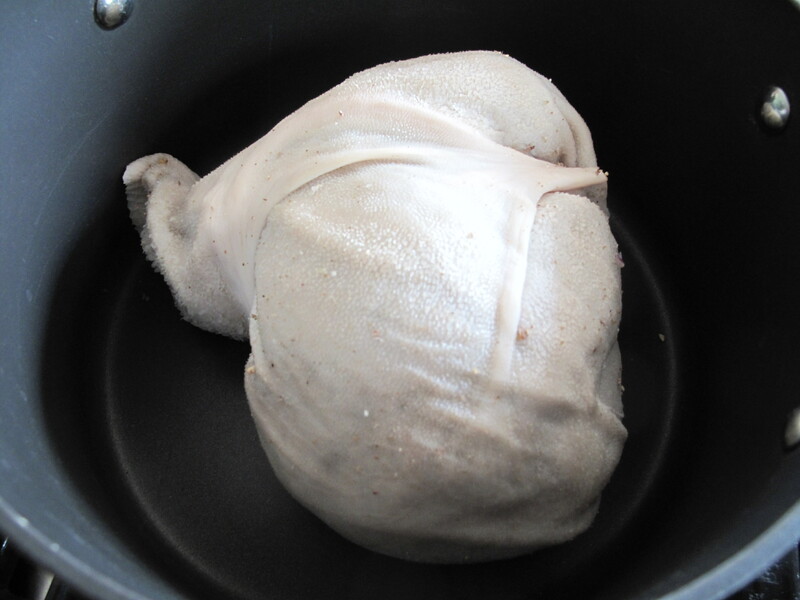 Next time I would try using some of the suggestions Dods has for toning it down – certainly substituting lung for kidney, sheep suet for beef suet, and the sheep stock for almost any other stock I might have to hand. The alternatives are clearly marked below. Strew the toasted oatmeal over the other ingredients, add all of the dry seasonings, and lightly turn everything over with your hands to mix. Take your pouch and stuff it with the mixture, using your hand. When it is a little over 3/4 full, pour in the stock and lemon juice, then sew it up along the long side. Do not over-fill the bag: the contents need room to expand during cooking. My photographs of haggis making have just been licensed by Magilla Entertainment for use in their forthcoming TV series ‘Edge of America’. It seems it is even more difficult to get hold of all the basic items of sheep offal in the USA than it is in the UK, so my pictures will be the means of taking the whole process right back to basics for the American audience!